I want to share today’s workout routine with you, because it was a little weird and kind of fun, and still gave me a great back workout and more. You might even want to try this, but real quick, some back story. (you can read about it here: http://mosladder.hubpages.com/hub/Adventures-with-Suspension-Training-in-My-Garage-Gym) I have had something of an obsession with the stuff. The rope that is. 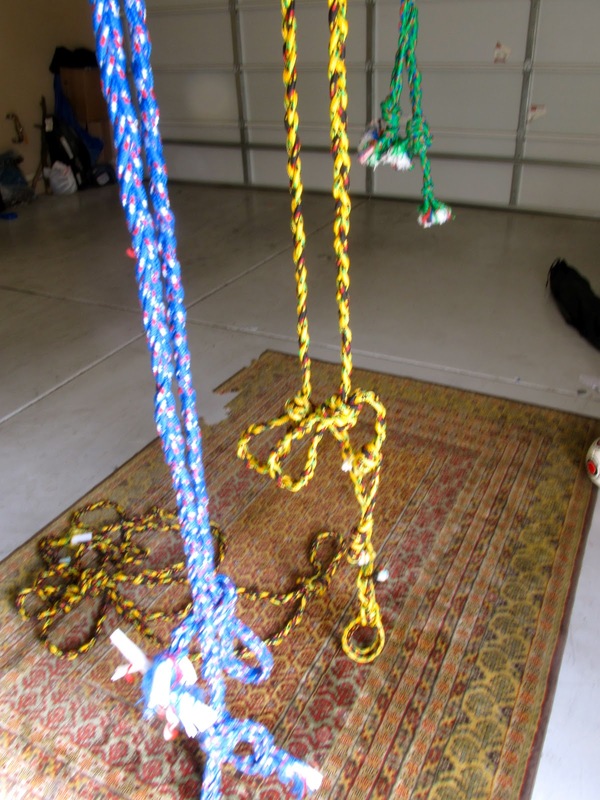 I made a jumprope suspension trainer, pull-up handles with pvc and rope, I even made a tire swing/climbing rope with yellow 1 inch polyester rope. Braiding the rope became a therapeutic pastime. 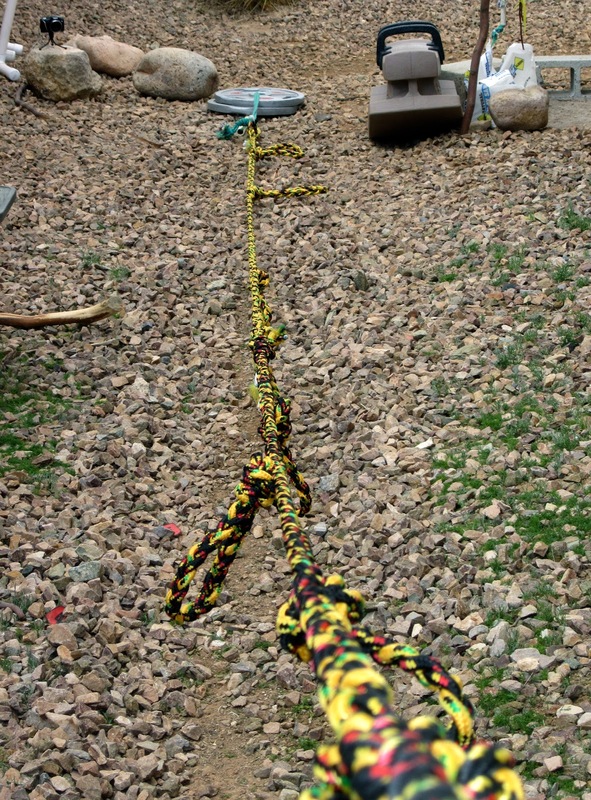 Take a 100′ foot length of rope, cut it into three or four equal lengths and braid it together. It would be used for something, I just wasn’t sure what. which could be called ‘suspended ladder training,’ since that is what it is. Two narrow ladders with multiple rungs. The rungs/handles are stiff, the rest is not. The nice part is there is no adjustment necessary, and you can do crazy things like ‘jumping dips’ to the next rung. Bingo! 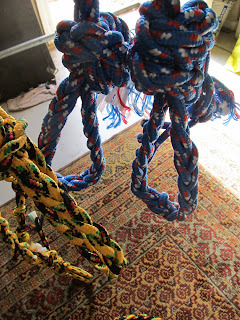 Why not tie some handles into my braided ropes and use them like the universal strength apparatus? 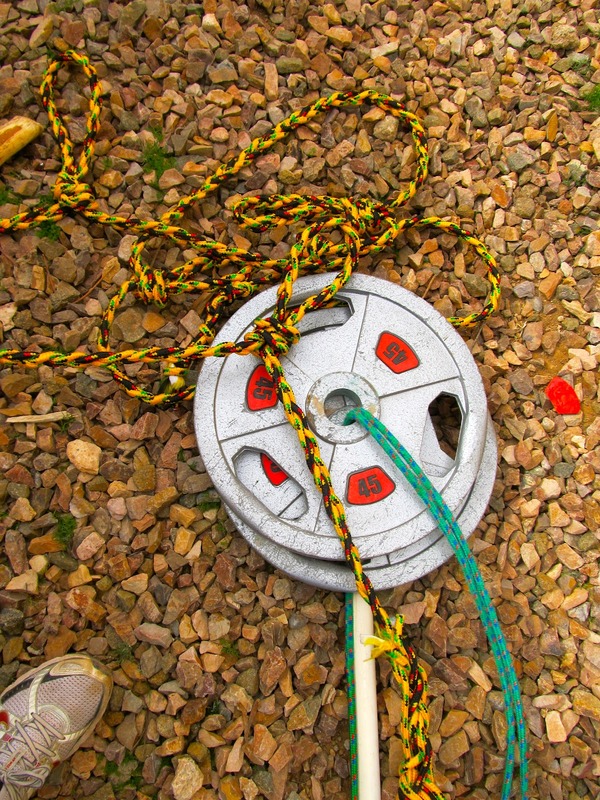 Using two braided ropes with loop handles tied in every few inches, I could hang them side by side and get a ‘suspended ladder training’ style workout. Before the second one was done I tried it with one. 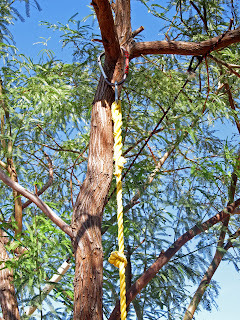 I used the yellow and black hanging in the picture below by throwing it over my pull-up bar. Hmmm, it was a little awkward, but good for pushups, flyes, body rows and the like. Still not a USA, though. This wasn’t working. Does the contraption above look strange and uncomfortable? Yeah, it was, in a bad way. So I thought about it some more. In the meantime, the thicker blue rope (with only two handles) made the perfect suspension trainer, and was comfortable enough to get a full workout on. Adjusting by looping the ends around the pull-up bar is easy. 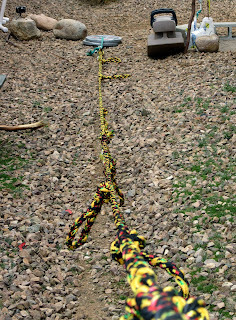 Still, what to do with all this yellow and black rope? Functional exercises are great, and in this case, you can target your back muscles as well. Which brings me to today’s workout, which consisted of standing in place pulling the weighted rope towards me in a hand over hand motion. Let me just say this beats the hell out of rowing a barbell or dumbbells, and IMHO, is better than sitting in front of a machine with cables. 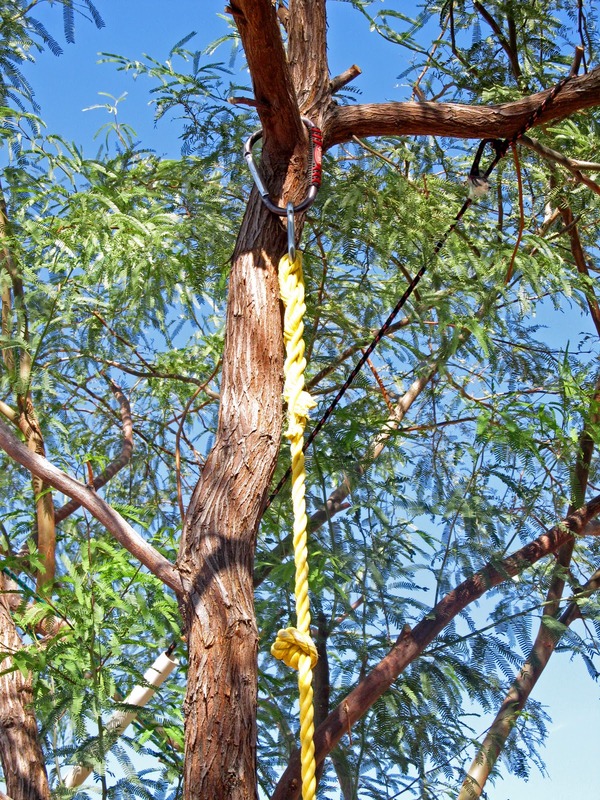 In the pics above, you will notice a green rope and some pvc pipe. The original plan was to loop the braided rope end through the plates and tie a large knot to pull against the plates. But I found this pipe and rope sitting around, and that was that. The only tying involved was green rope to braided rope. Done. One plate was good for getting a rhthym, but far too light for a decent workout. So I threw another 45# on. Much better. I probably knocked out 10 back and forth laps before doing a few pull-ups and curls and calling it a day. My lats were definitely worked and my arms as well. There were other advantages to this fun outdoor workout too. 1.) Core involvement. The hand-over-hand motion requires core rotation plus hip and glute stabilization; and who doesn’t want a tighter core and gluteus? 2.) Progressive Resistance: Because I was dragging these plates through the gravel, the closer it got, the harder it became. Also, the more weight you add, the greater the drag because it picks up even more gravel. This works well in sand, too. This exercise/workout will be part of my permanent rotation from now on. There are a myriad of ways to use this. Put the handles in front and push, or hang them from your shoulders and pull like a sled dog. Either way, this satisfies my need for unusual, interesting and effective workout equipment!